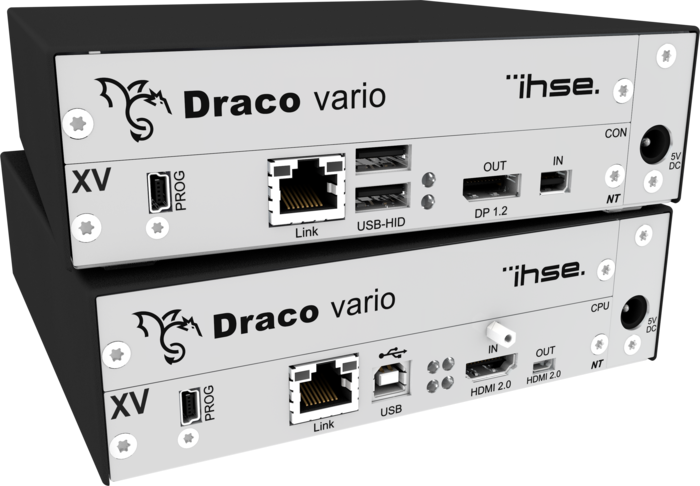 IHSE’s Draco Ultra KVM extenders deliver unprecedented quality with imperceptible latency in the transmission of high definition video, with keyboard, mouse and data signals. For ultra-high-resolution video signals, the Draco Ultra series is now offered with CATx devices to supplement the original fiber versions. The models support DisplayPort 1.2 and HDMI 2.0, enabling transmission of 4K60 video with a color depth of 10 bit per RGB color channel and optimal 4:4:4 color sampling over a single CATx connection. The expansion of the series enables users to integrate ultra-high-resolution video signals into CATx infrastructures. Existing copper cabling no longer needs to be replaced by optical fibers in order to support the maximum resolutions and frame rates. In addition to compatibility with all Draco Ultra extenders, the new extenders are also compatible with all Draco Vario add-on modules for audio and serial signals and are ideal for use with Draco Tera matrix switches. "The choice of transmission media no longer plays a deciding role in distribution of ultra-high-resolution video signals," explains Mark Hempel, Product Manager at IHSE. "Cost-intensive new cabling with fiber optics is no longer necessary to transmit 4K60 signals at the highest quality".